Mmmmm, the food in Maine is de-lish! 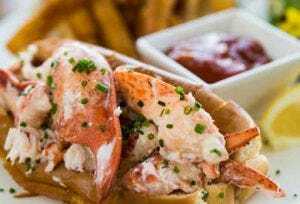 Couple yummy lobster rolls and seafood with stunning art and great ocean views – and you have yourself quite the vacation. And a great reason to visit: Maine Food. You can think of it as a year round celebration of all things lobster, seafood and yummy. The Maine Food Scene is quite, well, tasty. The inside of the sugar shack is fascinating – and really not much has changed in making syrup for centuries. As the old Mainer’s say ‘from the time the first crow flies, usually in late February, to sometime in mid April, the sparkling clear “sweetwater” flows’. Check out our Best 5 Ways to Enjoy Maine Maple Sunday for a sweet take. The Art of Dining dinners featuring fabulous chefs and cuisine in relaxed home settings. Gorgeous Hinckley Yachts with cocktails, yummy bites and live music. And don’t think Maine food is all about being stuffy. Perfect example is Brews and Tunes. It’s an afternoon of–you guessed it–beer and live music. Check out our Best Things to Do at the Kennebunkport Festival. Well, you have to eat – might as well make it yummy and fun. Sign up for one of these classes and learn how to make an amazing menu. You’ll have a blast with watching chefs in this professional kitchen and being pampered with a gourmet lunch. Classes like ‘Sensational Maine Seafood’ showcase pan seared crab cakes and baked lobster almondine and lemon pound cake with wild blueberry syrup. Coupled with a discount at the school’s store and you’ll fill yourself all sorts of tasty goodies to bring home. Check out our Best Shopping in Ogunquit if you want to work up an appetite. Of course we all know that beer goes with football. Here in Maine, we make that a craft beer. So check out a flight of locally made Maine beer at Cornerstone in Ogunquit or hop from Tributary Brewery in Kittery to SOME Brewers in York to Shipyard in Eliot to Federal’s Jacks in Kennebunk. Just be sure to designate whose drivin’! Check out our Best Things to do on St Patrick’s Day if you join us in March for green beer and more. It’s a vacation and nothing says relaxing like a yummy brunch. Sure, may have to wait with other vacationers unless you are up with the chickens, but crème brulee French toast is worth it. Just remember you don’t have to cook this meal and this way, you won’t have to clean up either. There are endless breakfast options in Ogunquit. Check out our Best Easter Brunches if you join us for the holiday. Still not sure about the Maine Food scene? Add a little extra fun with a walk along Marginal Way or a drive to the top of Mt. A to see the stunning view and work up the appetite. Be sure to bring your camera. There really is nothing as refreshing as crisp Maine air and the joy of visiting real Mainers cooking up real Maine food. If you’re thinking of visiting our Ogunquit hotel to enjoy a cozy cocktail by the pub fireplace or head to Maine for delicious fun, check out our specials and restaurant recommendations to go with our great hotel room choices and central location.